The system capacity margin for the UK power market fell to 4% heading into last winter. Across the winter generation margins have remained weak and the inaugural UK capacity auction cleared at a price level under 20 £/kW. This has left owners of less efficient coal and CCGT plants in a difficult position. So far in 2015, 5 GW of coal and CCGT capacity has been closed or earmarked for closure over the next twelve months. An additional 5 GW of older capacity has failed to qualify for capacity payments in last December’s auction. These plant remain operational, but with forward market margins well below fixed costs, further asset mothballing or closure decisions are imminent. The UK power market cannot afford to lose 10 GW of flexible thermal capacity. So the stage is set for a game of political and commercial brinksmanship to determine which plants will survive. As this plays out the UK system capacity margin is likely to remain very tight for the next three winters. The absolute level of power prices in the UK is determined predominantly by the cost of gas, given the dominance of CCGTs in setting marginal prices. So it is more important to focus on spark and dark spreads, or gas and coal plant generation margins, when assessing plant economics. However UK forward market spreads have so far shown a muted reaction to the tightening system capacity margin. 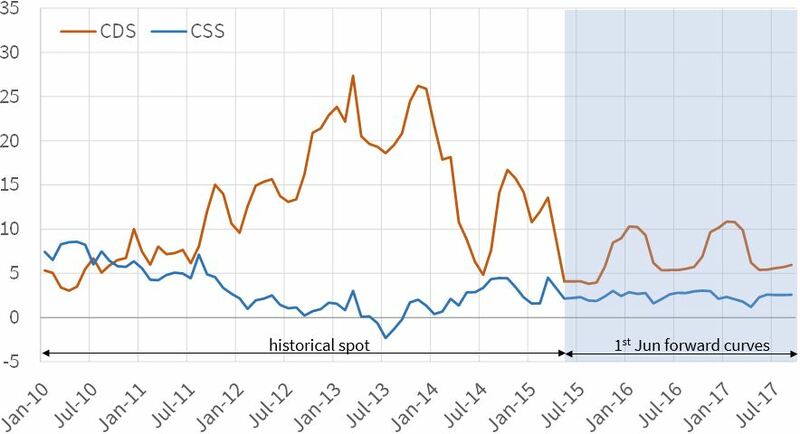 The evolution of baseload and peakload clean spark (CSS) and dark (CDS) spreads and current forward curves are shown in Charts 1 and 2. These factors combine to create a very tough margin environment for less efficient coal plants without a capacity agreement. Although CDS remain marginally higher than CSS, coal plant fixed costs (typically 40+ £/kW) are much higher than for CCGTs. 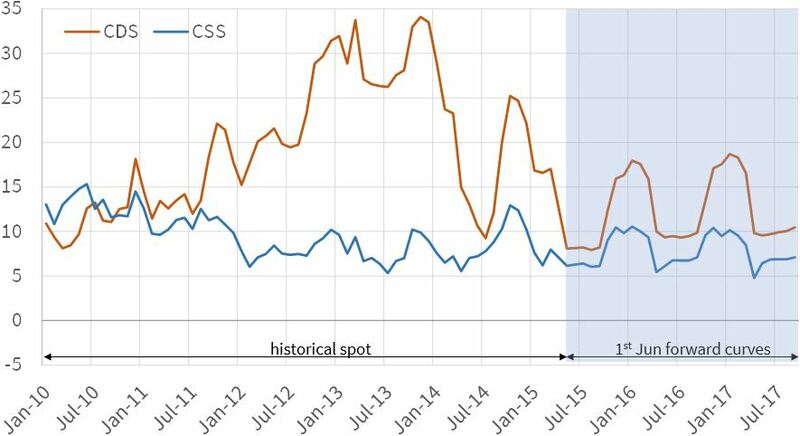 CCGT margins (CSS) have recovered somewhat from their weakest levels in 2013, but remain relatively weak on a forward basis over the next 2-3 years. Around 10 GW of CCGT capacity is out of merit (i.e. running at zero or very low load factors). With a CCGT fixed cost base of 20-25 £/kW, the future does not look bright for older assets with no capacity agreement. Supplemental Balancing Reserve (SBR) contracts are about the only source of hope, but pricing of these contracts is likely to be competitive given the overhang of distressed gas and coal capacity. Somewhat counterintuitively, the first capacity auction has precipitated a number of asset closures (as we foreshadowed here). The auction has clarified expectations around capacity price returns going forward, which combined with the weak energy market conditions described above, has been too much to stomach for owners suffering ongoing fixed cost burn. In the case of Longannet, high transmission costs in Scotland have also contributed to poor plant economics. 5 GW of capacity available last winter has either been closed or ear marked for closure as shown in Table 1. Another 5.7 GW of other older plants (4 GW coal, 1.7 GW CCGTs) remain open but under imminent threat after failing to secure capacity agreements. Expect further announcements of mothballing and closures as the year progresses. Despite the system capacity balance being very tight, National Grid’s analysis of system margins last summer predicted 3-4 GW of additional thermal asset closures by 2017. This analysis showed tightness in the system capacity margin peaking in the coming winter (2015/16), before new capacity build (predominantly renewables) and declining system demand starts to improve security of supply. 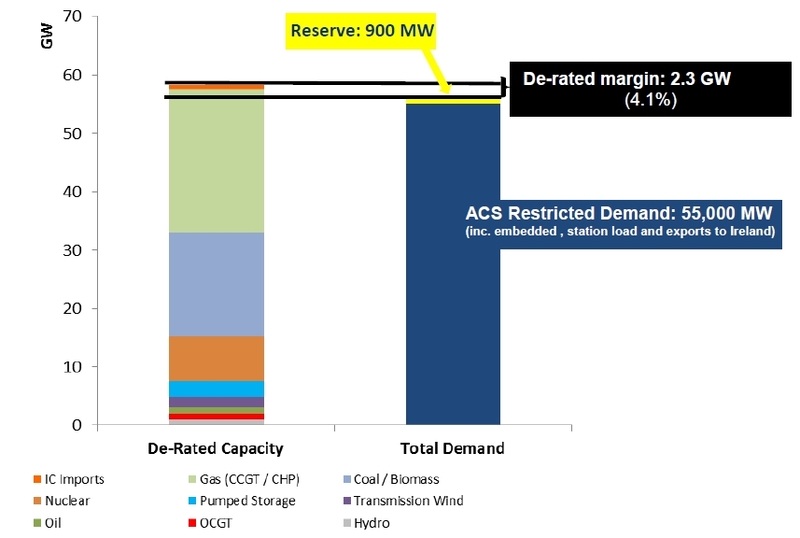 Grid’s assessment of de-rated system reserve margin for last winter is shown in Chart 3. The chart illustrates the 2.3 GW reserve margin last winter in the context of the 5 GW of closures announced so far this year (note a ~85% derating factor needs to be applied to the 5 GW to make it comparable). Grid’s assumptions in calculating reserve margin (e.g. on peak winter demand and interconnector availability) are intentionally conservative. But nevertheless more closures and a cold winter would appear to leave the UK power market in a precarious position. The last two winters have been relatively mild and windy causing little in the way of challenge to security of supply. Our suspicion is that the UK government and Grid will not be keen to ‘roll the dice’ on a third mild winter. The focus for alleviating system capacity issues is on Grid’s SBR contract auctions. SBR has become a somewhat opaque temporary mechanism to bridge the period until new capacity comes online from the first capacity market auction (by 2018). Plants that successfully secure SBR contracts may live to fight another day. But the remainder of the 10.7 GW of plants that failed to secure capacity agreements remain on the endangered list.